Fish smoking kiln. Photo courtesy. 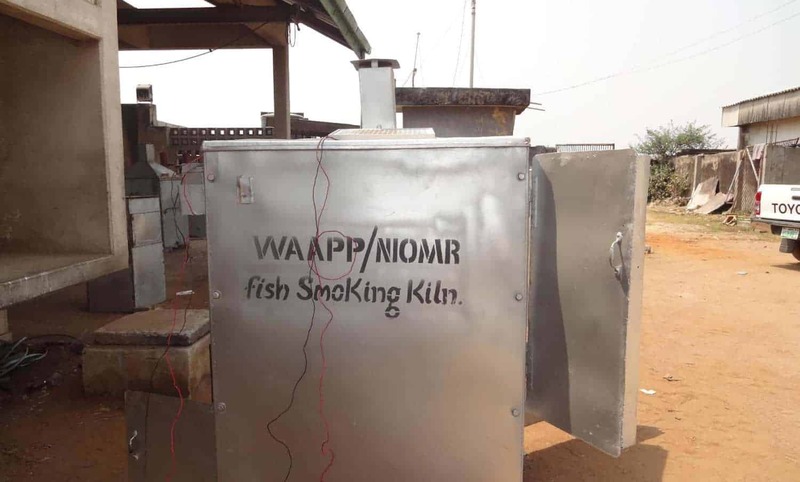 Nigerian Institute for Oceanography and Marine Research (NIOMR) has developed a smoking kiln to help improve income and transform lives of West Africans farmers and fishermen who have be incurring losses due to fish spoilage by relying on traditional methods of preserving fish. According to a 2015 study on Overview of Traditional Fish Smoking in Africa by Olusola Oyewole and S. A. O. Adeyeye, due to inadequate post-harvest processing and preservation of fish losses reach up to 40 per cent of the total catch by weight as farmers rely on traditional methods to preserve their produce. The smoking kiln is comprised of a smoking chamber, a fan to distribute heat, a thermometer to control temperature, and a chimney to filter air. This make it reduce cooking and smoking time from four days to just four hours. The fish smoking kiln eliminates many challenges West African fisheries typically encounter with traditional smoking methods which include lack of control over the drying process, exposure to dirt and dust, insect infestation, exposure to contaminants, and low capacity. “We looked at the old ways of doing their smoking, and we were able to identify that there were clearly a lot of challenges,” says Dr. Oludare Adeogun, Research and Development Scientist at NIOMR and Coordinator of the National Center of Specialization on Aquaculture. Soon after farmers and producers begin to use the kiln to mitigate these challenges, “they can see the impact of the smoking kiln, and they love it so much,” says Adeogun. “When you smoke your fish very well, you can make more money than when you sell it fresh,” explains Adeogun. Not only is smoked fish more valuable, but it also lasts longer increasing the sales duration. According to NIOMR, using the fish smoking kiln can reduce post-harvest losses by 70 percent and rapidly increase incomes for the five percent of people depending entirely on the fisheries sector for their livelihoods in West Africa. FoodTank, a food security advocacy in the region, reports that currently, fish producers in Benin, Cote d’Ivoire, Gambia, Ghana, Nigeria, and Senegal use the technology. A capture of the ICRISAT digital seed roadmap. International Crops Research Institute for the Semi-Arid Tropics (ICRISAT), an international agricultural research organization has launched modern digital seed ‘catalog’ and seed ‘roadmap’ tool to enable famers access information about the quality and availability of seeds in one click. This innovative tool will ultimately enable farmers in several African countries to access seed varietal information quickly and help them plan seed production over a long period. The online catalog provides information on all seed varieties available nationally and regionally over a long period. It comes at a time reports indicate that in sub-Saharan Africa, smallholder farmers still face challenges in obtaining good quality seeds on time, mainly due to lack of access to information about them. To address this need, ICRISAT’s Digital Agriculture team, as part of the HOPE II and Tropical Legumes III projects, has created an online seed catalog and a digital seed roadmap tool. At the national level, seed roadmaps enable governments, small-scale seed producers and the private sector to plan, produce, monitor and provide quality seed to smallholders, no matter what the locality. Both the seed catalog and digital seed roadmap are now available to actors and stakeholders in the seed system. However, no tool is effective until the stakeholders actively adopt it and use it as part of their regular tasks. With this in mind, ICRISAT, through the various projects, is organising a series of workshops to demonstrate the use of the tool to various seed system stakeholders including extension workers and staff of research institutes and seed companies. “The common goal is access to quality seeds, in adequate quantity and in a timely manner by smallholders, which is important for the transformation of agriculture in Africa,” said Dr. Aboubacar Touré, ICRISAT sorghum breeder.